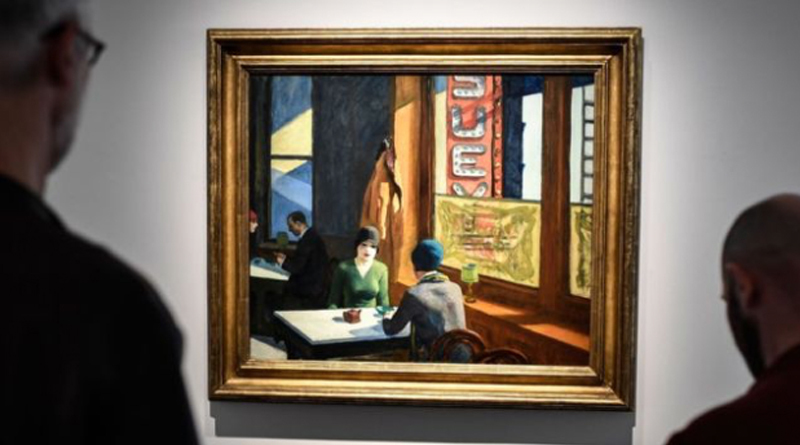 An iconic painting by famed US artist Edward Hopper has sold at auction in New York for nearly $92m (£70.7m). The 1929 painting Chop Suey becomes the most expensive of Hopper’s work ever bought at auction. It was one of 91 modern American art paintings put up for auction by the estate of US entrepreneur Barney Ebsworth, who died in April. Willem de Kooning’s 1955 Woman as Landscape sold at the same Christie’s auction for $68.9m. This set a new auction record for the Dutch-born abstract expressionist, surpassing his 1977 Untitled XXV which sold for $66.3m in 2016. The Ebsworth collection was described by Christie’s as “representing the rise of American art across the 20th Century”, with an array of modern art styles from cubism to pure abstraction. The entire collection was valued at around $350m. Edward Hopper was famed for his depictions of modern American life. He died in 1967. Chop Suey, which Mr Ebsworth bought for just $180,000 in 1973, portrays two women in conversation at a Chinese restaurant. The painter’s previously highest selling work was East Wind Over Weehawken, which sold for $40.4m in 2013.